Derived from the motto of the MacCarthy clan under the kingdom of Desmond. A phrase stitched into the famous red jersey over the last number of years. Eight simple words that have so much meaning to myself and many, many others. Two years later, same venue, French opposition again. 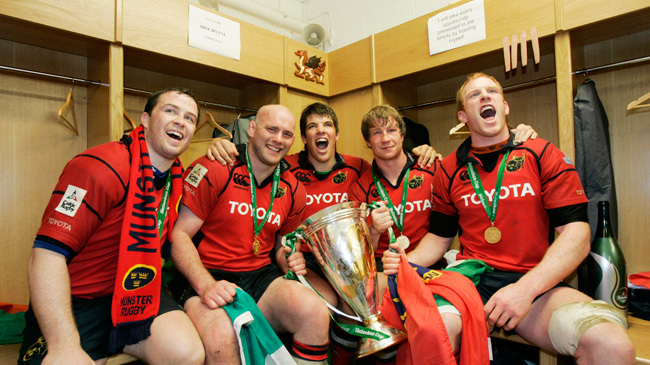 Same end result, a Munster victory and we were Kings of Europe again. In a way building on Munster’s recent successes, the following Six Nations tournament resulted in a first Grand Slam victory for Ireland in over sixty years with our very own Declan Kidney at the helm. Irish success over Munster success started to creep into the minds of many a rugby fan after this I feel, Club vs Country, Provincial vs International, the green machine becoming more important than the red army. “Irish by birth, Munster by the grace of God”. Our esteemed provincial colleagues from Dublin Leinster trumping us 3-2 in the European Cup stakes in the next few seasons did no favours either. Tony McGahan took over the reins from Kidney, a head coach who at the time was probably not up to standard but credit to the man currently he is doing a fine job at the Melbourne Rebels this Super Rugby season. Sadly McGahan oversaw four seasons of retirement after retirement after departure after retirement, heroes of 2006 and 2008 gone in a flash. It is a lack of these heroes, idols, guys to look up to, lads who make young kids say “I wanna be like him!”, this is where I think our spirit has gone. In the last number of years, many Munster supporters have been more keen to see Paul O’Connell wear the green of Ireland rather than red. A talismanic figure, captain of the national team, respected by all and labelled by his contemporaries as the finest second row they have ever faced, but more important to Ireland than his home province. I have been guilty of it myself, admittedly. Donncha O’Callaghan, probably the fittest thirty six year old you will ever see, I met him in Cork around Christmas time this year and felt compelled to apologise for his lack of match minutes last season, even though it had nothing whatsoever to do with me, I still felt the need. The list goes on, Jerry Flannery, Denis Leamy, David Wallace and so on and so forth. These men were and still are idols to me and others, but that number is dwindling and dwindling rapidly. The supporters who still bother to attend have very few players to identify with, guys are here for a season or two and then gone to the Premiership or Top 14 to earn their retirement money. There hasn’t been a marquee signing since Jean De Villiers, and look how that turned out. Thankfully there are some players in the current squad who fit the bill of a hero, Peter O’Mahony, Keith Earls, CJ Stander, Conor Murray, Simon Zebo, the ageless BJ Botha, but this is a lot fewer than before. Munster Rugby has also plenty to answer for, changing face from a rugby club to a corporate vehicle over the last number of years, Munster Rugby Inc. If you will. The reason for the odd blue and yellow seats in both the east and west stands of Thomond Park, in case anyone doesn’t know, is so that on TV it looks more like a full stand rather than walls of empty red. Glass half empty outlook right there, its almost as if directors and board members are expecting not to fill the stadium. On December 12th of last year, I happened to be in Limerick, about half a mile down the Old Cratloe Road from Thomond Park. A European Cup pool match between Munster and Leicester was taking place, apparently. The attendance figure of over 22,000 at that match is a stretch of the imagination to say the least, that amount of tickets may have been sold, but there was clearly no more than fifteen thousand through the gate that evening, for a crunch tie between two of Europe’s traditional heavyweights! There were times when Limerick and Cork would have been buzzing for a week before a game such as this, a fella would need to beg, steal and/or borrow to secure a ticket. 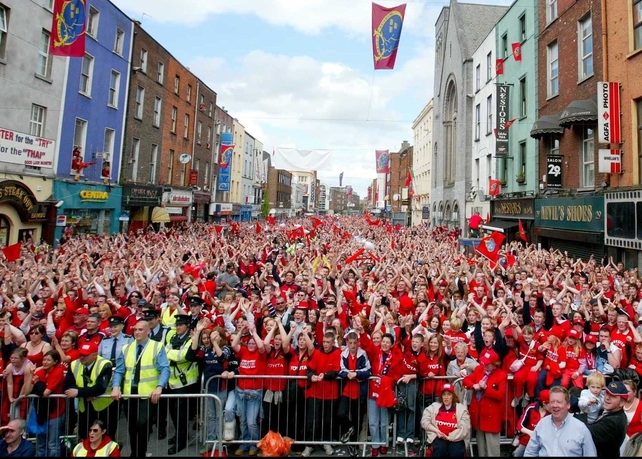 Trains and buses would be packed after about 3PM that day, pubs would have fans spilling out onto the street, tossing rugby balls and themselves up in the air to catch them, the skinny chap in the middle of the makeshift line-out howling like his hero Paul, Donncha or Donnacha, take your pick. Ireland and international success trumping a night out in Limerick bumping into players both current and former after another raucous one in Thomond Park, once again. The mighty All Blacks borrowed an element of the phrase at the top of this article with their “Impossible is Nothing” advert in 2007. Nine years later, it still rings true for them. Whereas for Munster, it comes across as just another corporate slogan. Written by Munster Haka trialist Conal Lane. How Well Do You Know Your One Season Wonders?